Handsome and charming gentleman ! 7 " (17 cm) Handsome and charming brown eyed gentleman for the doll house! 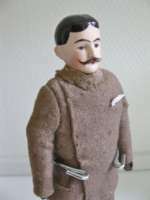 Brown eyes, dark brown hair, centerparted, great molded moustache, originally dressed in light brown felt suit and as a special detail he is wearing gloves. 3,5 cm x 4 cm (1 1/2" x 1 1/2"Lovely "swinging" wall lamp, Ormolu made by Erhard and Söhne ca 1880. Fine impressed design on the wall holder. It is possible to swing the lamp in the right position. ( Nice lamp for reading) Fine condition! The holder has to small holes for hanging on the wall. Antique Schneegas Davenport Desk for the dollhouse. A slant front top with a desk blotter, lifts open for storage. Three drawers on one side and a cupboard on the other hold additional supplies.3 3/4" t x 3 1/8" w x 2 1/8" ( 9 x7 cm) Decorative scroll cut legs ,scrolled pediment at the top and and original pewter knobs . Cherry wood often referred to as "Golden oak".Made in Waltershausen Germany ca 1880. Excellent condition. Bedårende søgt Rosebud dukke, negerdukke med lukkeøjne med kuffert fyldt med tøj /tilbehør(40-dele). 4 par Sko, meget tøj, sele, sutteflaske etc. Perfekt stand. Stemplet i nakken "Rosebud made in England". Yndig lille dukke fra 50-erne der for barndomsminder og håndarbejdstimer frem i erindringen. Gamle metal rulleskøjter, ski og rygsæk til dukke Rosebud? Gamle metal rulleskøjter, ski og rygsæk til dukke Rosebud? Samlet pris . 4 x4 cm (1 3/8"x 1 5/8")Red leather photo album with gold impressed decoration the side. There are 12 pages with double sides with 24 DAGUERREOTYPE (tinplate photographs) Wonderful accessory for a large scale dollhouse or as accessory for a fine doll.. The leather and tinplates are in fine condition.Hand writed names to some of the photos on the pages-which I find charming. (2" x2")5,2 x5,2 cm Antique golden miniature Jewelry box-French ca 1880. Glass lid with clasp to open. accessory for your dolls jewelry. Fine condition and highly decorative.